Super cool mesh cycling liner. Convert any short into a cycling garment and enjoy your bike ride. This cool micro mesh liner is great as an undergarment. It is made from a soft and stretchy fabric. Wicking 83% Polyester / 17% Spandex Mesh Fabric is extremely breathable and cool. Legs stay in place with light elastic. Flatlocked seams are soft and smooth next to your skin. This garment makes a good padded liner for lots of activity. Also see our removable chamois pads. 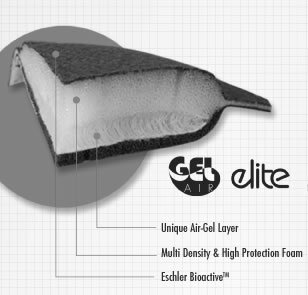 Women's Elite Gel Air Mesh Chamois Pad. Carbon Fabric Surface - This women's chamois pad has a fabric surface developed by Eschler bioactive. Eschler is the best of class for high certification standards that guarantee their ability to wick perspiration, and quickly evaporate moisture. The natural antibacterial properties from silver ions are knitted into the yarn. The shock absorbtion comes from an airmesh gel that is created with three dimensionally worked yarns that produce a shock absorbing effect that is more lightweight and cooler than traditional gel. The Italian made chamois pad is excellent for long distance bike rides. This is a seamless pat that a surface design with a 3D combination of foams fitted together like a puzzle engineered to absorb road shock and act like a pillow on the saddle. The fit is anatomically designed with a combination of elasticity and density. This pad tested in the excellent category by our product development team. 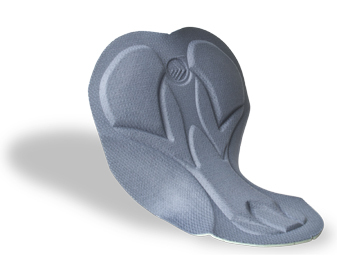 Women's Elite Chamois pad is engineered for long distance coolness and comfort. 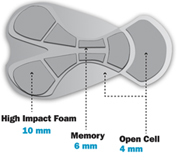 The Air Gel Foam Insert is targeted for High Impact areas -it absorbs shock and creates air flow for coolness. improve muscle performance, enhance blood circulation and even the distribution of heat. The antibacterial finish is guranranteed permanent. This pad is ideal for superior cushion and long distance cyling. So pleased with these shorts couldn't find any to fit in New Zealand. Shorts a good length and high enough tin the waist. Fit as expected. Body of shorts are mesh so they are cool under other garments. Padding was very good for a 40 mile ride. Good choice if you're looking for padded shorts to wear under another garment. I'm a bit chunky and these were comfortably stretchy at the thighs and waist. I can last the whole class now! Fit well......not binding....don't even know you are wearing them!! Plus size woman's gear that actually fits! After struggling for months to find some plus sized gear locally that I could try on and failing I finally bit the bullet and risked purchasing online from across the border (I'm in Canada). Prices are reasonable to start with but by the time I had to add interenational shipping and duties I was a little wary. Packaged arrived VERY quickly and to my absolute joy everything fit beautifully! Worth every penny, I can't wait to wear them out and come back to order more. 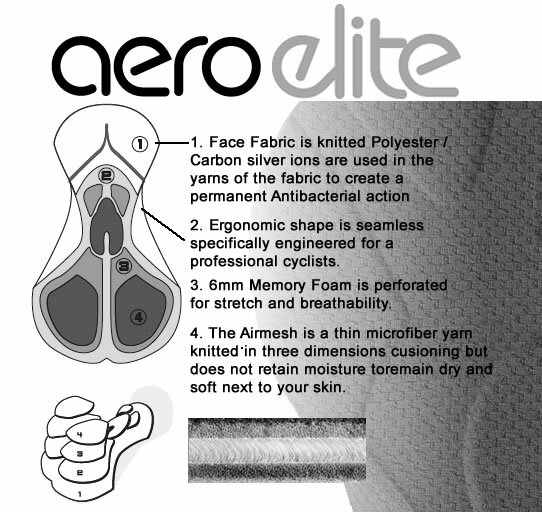 Thank you Aerotech for understanding it's not just super skinny women who want to be comfortable when they ride!! I wanted to be able to utilize the exercise clothing I already had for longer bicycle rides. These liner shorts are perfect. The mesh is breathable and the fit under my capris is good, not bulky at all. The padding is adequate. The longest ride I have worn them on is 34 miles. I bought 1 pair, liked them so much I bought another pair. I like the fit of these liners. I am 5'6", 130lbs (size 8) The waist is a little higher than some and hence minimizes the muffin tops! The length is long enough not to ride up, but are short enough not to show below a skirt or shorts. The chamois is comfortable while riding, but feels a little like a diaper in the back when off the bike. Perhaps this is because the liners don't have as much spandex as regular bike shorts. This aside, they work well, are comfortable to ride in and I love the purple! I bought these liner shorts to wear under jeans and other "normal" pants when commuting to work. They are fantastic. Light but comfy. In fact I often just leave them on all day rather than change out of them. The fit is perfect. The padding is more than sufficient for my 28km round trip commute each day. I love the purple (easy to locate in my drawer) and I love the fit and length. I couldn't be happier. I bought two pairs and use them every week. Have been wearing these liners on a 10 day trip in Germany. They are very comfortable. What I especially like is that the elastic on the legs is not too tight. I am new to biking,so I have not been able to compare these to other biker shorts. However, I ordered one pair after my first month of riding and being entirely too sore, and after trying to find some in stores that would fit me (6'0, 195lb, female). If you can buy an XL in a store like REI, the XL here is too big for you, especially if you are not tall. Anyway, I purchased one pair and found that they did an excellent job of providing padding, were cool and absorbent which kept all moisture away, and prevent chafing 100%. I went back and ordered 2 more pairs since i plan to ride for my daily commute to work.. Excellent fit, comfortable, washes well and dries quickly on the clothes line. Highly recommend. The extra padding is very nice but the sizing was a little tricky. I usually order a size up when purchasing clothes for cycling, but I wouldn't do that with this item. They definitely have plenty of room for a larger sized rider. No bunching or rubbing creates a happy ride. The interior pad is not sufficiently thick. The back section is not bad but the front part of the pad is too inadequate. Too bad because they are lightweight and easy to wear under shorts. Used these for the first time on a trail ride this past week-very comfy, fit well, performed as expected. My only suggestion-the leg "grippers" did not really grip as well as other bike liners I have had. I'm 63, female, love cycling, motorcycling, kayaking. These add 100 percent more comfort in all sports where you sit! I'm so excited to have found these! 170 miles in 3 days! Recently, after purchasing my first pair of ADT Women's Elite Air Gel Padded Cycling Under Liner Shorts and being quite satisfied I purchase a second pair in preparation of Tour DaVita 2016. My husband and I rode our tandem 170 miles over the 3 day event. This included my 3rd and 4th metric century. I love these shorts!! They are great for long distance rides just as described. Thank you Aero Tech for making these in larger sizes! Really like the mesh fabric. lightweight but with some support. I have worn them twice for relatively short trips. The chamois has good amount of padding. Although these cycling liner shorts are designed for bicyclists I thought that I would take a chance and see how they might improve my comfort riding my horse on 3-5 hour trail rides. I was unsure how I would feel wearing the shorts under my jeans and how much bulk the padding might add which could be uncomfortable. I honestly could not have been more pleased with the fit and comfort they provided and now consider them an absolute necessity for riding! Extremely please with the quality of this product and will definitely be ordering another pair. The cycling shorts are excellent quality and a good fit for a XL person. I would recommend them to anyone. Great for wearing under jeans or cut offs. And the purple color is bitchin. Bicycle seat bottom greatly reduced! Came very quickly. Design works well under tights for spring comfort. Quite pricy. Waist sits well but, as ever for me, the elastic on the legs just a bit tight for my sprinters thighs. By having this under liner short, I can vary what I need to wear over top based on the temperatures. It was in the 50s when we started so I wore capris as the top layer. I was pleased with it on my 21 mile this past Sunday. Padding is great! As it gets warmer, I play to pull on shorts overtop or maybe a cycling skirt. Thank you for offering extended sizes that fit! Finally some cycling shorts that have a high rise. I was impressed with both the quality and fit of the Wimens Elite Air Gel Padded under liner short. I've used these liners several times now as I wear them under my winter cycling tights. They are comfortable and good for longer rides. I also like how the pad has a lower profile in the front region. These under liners are worn under your pants. They are worn next to your skin and thin enough to fit comfortably under your outerwear, but thoroughly cushioned where it counts. The cushioning protects the sensitive bits from the bicycle seat -- and molds to your body so you don't feel awkward when off the bike. The fabric is light weight, but helps wick sweat away from your skin. They are expensive -- especially considering they are underwear -- but versatile and practical if you don't want to wear bike shorts as outerwear. I promptly bought two more pairs after trying out a pair.